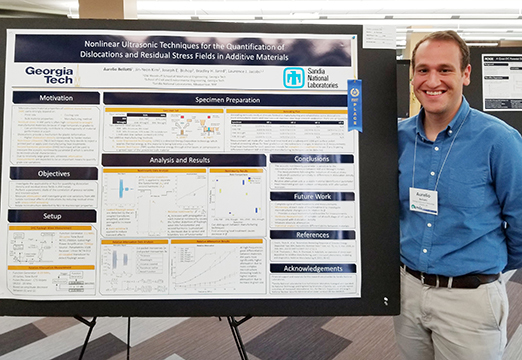 Woodruff School graduate student Aurelio Bellotti was awarded first place prize in the student poster competition at the 45th annual Quantitative Nondestructive Evaluation (QNDE) Conference for his research on “Nonlinear Ultrasonic Techniques for the Quantification of Dislocations and Residual Stress Fields in Additive Materials." The QNDE conference, held this year in Burlington, Vermont, is the premiere international nondestructive evaluation meeting designed to provide an interface between research and early engineering with the presentation of ideas and results to speed transfer to engineering development. QNDE is a highly interdisciplinary technology that involves the use of various techniques to detect both manufacturing and service related flaws in materials and structures which are important to safety in essentially all industries. 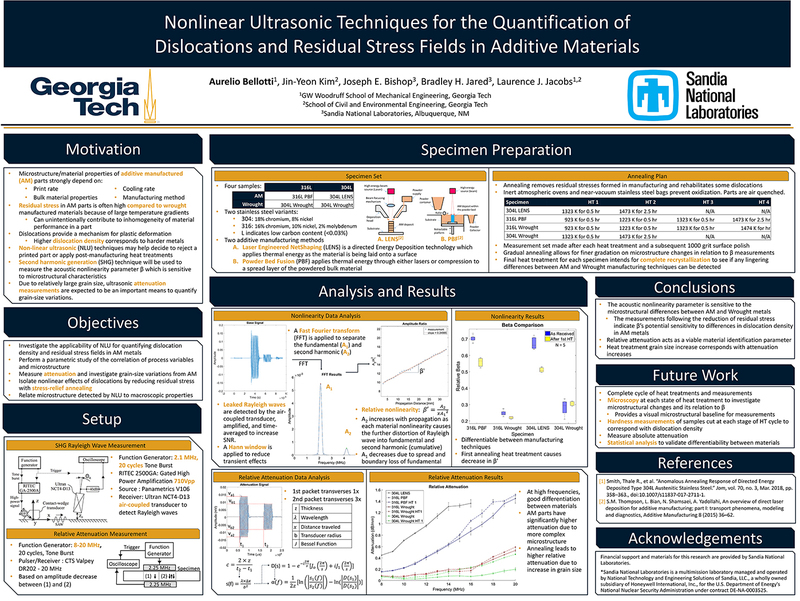 Bellotti’s research investigates the use of nonlinear ultrasonic techniques for quantifying dislocation densities and residual stresses in additively manufactured (AM) metals. AM materials are subject to large microstructural variations from manufacturing method, print rate, bulk material properties, and cooling rates, which all lead to uncertainties in their material properties. Second harmonic generation techniques are used to measure the acoustic nonlinearity parameter, β, which is sensitive to microstructural characteristics. The nondestructive evaluation (NDE) of AM parts could help in the decision-making process to reject a printed part and increase the confidence for using AM materials in critical applications. "The Annual Review of Progress in QNDE Conference attracts the top international researchers in NDE,” said Bellotti. “We received great feedback on our work and were able to see other approaches to the expanding field of NDE in additive manufacturing. Presenting to researchers at other top universities, national laboratories, and industry, raises the influence of the work we do here at Georgia Tech and makes it exciting to know how our work can impact the research field and society."